Get information about International Spy Museum in Washington D.C. Keep in mind the museum’s location, open hours and admission. Tired of crowds of tourists? Bored by popular destinations and laid-back vacations? Want some extra adrenalin into your blood? In need of new experience? Then you’ve got into the right place! Browse through the information to get the expert ideas of how to make your holidays truly unforgettable and extraordinary. Keep off the beaten track with UnusualExperience.Com and see the world you have never seen before. The only spy museum in the United States is located in Washington, DC. More than 200 gadgets, weapons, bugs, cameras, vehicles, and technologies used for espionage throughout the world are exhibited in the International Spy Museum. Find out about microdots and invisible ink, buttonhole cameras and submarine recording systems, bugs of all sizes and kinds. Learn why and how these artifacts were developed. Discover stories of individual spies from Moses to Harriet Tubman, Elizabeth I to George Washington, Cardinal Richelieu to Joseph Stalin. You may listen to the lectures, films, book-signings, and family activities covering a wide range of spy-related topics. Here you may buy unique gifts at the museum store and have a lunch at any of two restaurants next door, Zola and Spy City Cafe. Gallery Place/Chinatown is the closest Metro station. 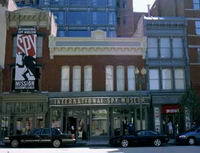 International Spy Museum has an entrance fee of $16 for adults, $15 seniors, $13 children ages 5-11 and children under age 5 are free. And tickets are assigned an entry time. So you should get in line early and plan the rest of your day according to your assigned time. Visit this museum is during the week and early in the day, so you will avoid crowds. It is closed on Thanksgiving Day, Christmas Day, and New Year's Day. Sometimes the museum closes for private events. Call the number (202) EYE-SPYU and get up-to-date information.